Dried fruit really is the best of both worlds; throw them in with the kids lunches, use as an after-school snack or scatter on top of ice cream for dessert! About to run? Get quick energy with a handful of Gerbs No-Sugar Added Dried Apricots. Dried Pineapple, Dried Banana Chips, Dried Mango, Dried Papaya, Dried Mulberries, Dried Sun Dried Tomatoes, Raisins, Dried Strawberries, Dried Goji Berries, Dried Figs, Dried Ginger, Dried Currants, Dates, Dried Cranberries, Dried Cherries, Dried Apricots, Dried Apple Slices and 6 Dried Fruit Mixes. HOW ARE DRIED FRUITS MADE? Dried fruit is what you get after the original water content has been removed either naturally, through sun drying, or through the use of specialized dryers or dehydrators. The earliest recorded mention of dry fruit is found in Mesopotamian tablets dating around 1700 B.C., which contains some of the oldest known written recipes. It is also believed that the early Phoenicians and Egyptians were responsible for expanding the popularity of dry fruits throughout the globe. Due to their long-term storability and ease of transport, dried fruits traveled with Christopher Columbus, Robert E. Peary’s conquest of the North Pole in 1908, and accompanied astronaut Scott Carpenter in outer space in 1962. Nearly half of the dried fruits sold worldwide are raisins, followed by dates, prunes, figs, apricots and peaches. Dried fruits contain little to no fat. Great source of energy for athletes. Dried fruits generally contain more fiber than the same-sized serving of their fresh counterparts. Fiber helps keep your digestive system running smoothly. Fiber not only helps your digestive system. According to the Harvard School of Public Health, it helps prevent obesity, heart disease and some forms of cancer. Dried apricots, for example, contain 6.5 grams per cup, while fresh apricots contain just 3.1 grams. A cup of raisins contains 5.4 grams of fiber versus just 1.4 grams for seedless grapes. Phenols, a type of antioxidant, are more abundant in fruits like dates and figs than in some fresh fruits, leading researchers to advise that more dried fruits be included in the American diet. Dried fruits like apricots, raisins, prunes and figs contain high amounts of beta carotene, vitamin E, niacin, iron, magnesium, potassium and calcium, reports the European Food Information Council. Dry fruits are considered to be very effective for improving hemoglobin. So what’s not to love? 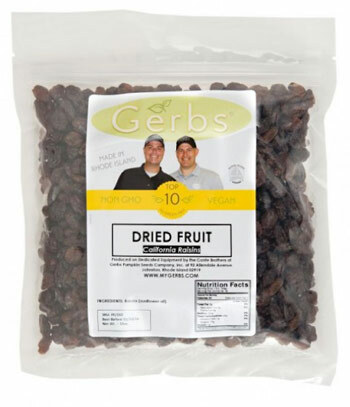 Save and order Gerbs Dried Fruit in BULK! There you can find a very good quality product I’ve seen so far .they are purely unmixed products. Which is very good .